Bob Sumner and I had planned to do a couple of days in the desert together following the successful Tiefort outing on Saturday, but temperatures were a bit too high for the long hike we had planned to Brown Mtn and without a good alternative we ended up going separate ways (he drove to Primm to do Little Devil Peak before driving home). I decided to put up with the hot weather as best as I could manage, doing shorter hikes so that I could quit earlier in the day if the heat proved too much. Immediately after the Tiefort climb I drove back to Barstow to spend the rest of the afternoon ensconced in the air-conditioned Starbucks until the sun had gone down. I then drove east on Interstate 15 to Baker, happy to see the World's Largest Thermometer was once again fully operational after years of neglect. It was still 83F at 7:30p. From Baker, I drove north on SR127 to Tecopa then east on Furnace Creek Rd to the road's highpoint near Tecopa Pass. The elevation here was barely 2,300ft, hardly enough to get cooler mountain temperatures. On the drive I had lowered the thermostat to 65F so that the van's insides would be sufficiently chilled to allow me to sleep. The outside temperature was still in the mid-70s, but it was nice enough inside that I had little trouble falling asleep. This officially unnamed summit has the dual honor of being both a P1K and the highpoint of the South Nopah Range Wilderness. The hike is not a long one, about 3mi one way and a bit under 2,000ft of gain. I was up early so that I could beat the heat, starting just after 6a. I had brought a bike with me on this trip, thinking it might be helpful for roads that I couldn't manage with the van. For the most part it didn't get much use, but today it proved helpful in getting me about half the distance to the summit. The old mining road I followed, once paved, was washed out not far from the start and was a cinch with the bike. I rode it past several mine sites to the road's end where the shell of an old sedan was parked. From this point Noon BM was clearly visible with most of the elevation gain still to go. I crossed over several drainages as I started up, eventually finding my way to the SSW Ridge which I followed to the summit in about 45 minutes' time. It was still fairly early, only 7:20a and so far the weather had been pleasant, the temperature around 65F. The air quality was decent with views extending for 40mi or more in all directions. Chicago Valley and the Nopah Range stretch out far to the north, California Valley to the east, the Kingston Range to the south and the tiny community of Tecopa to the west. In addition to the expected benchmark, I found a MacLeod/Lilley register dating to 1987. 24 pages of entries suggested the summit was more popular than I would have guessed. A number of the usual highpointing suspects were found among the pages along with a few deer hunters, but the majority appear to be from various geology field tours over the years. An unusual entry was from someone doing postgrad research at the Institute for Creation Research, an entity whose collective contribution to science appears to be absolutely nothing. In addition to the regular register was a terracache in a separate container. This seemed silly to me, so I packed up the terracache to place on another summit sans register. I should probably expect some hate-mail from the terracaching faithful. My return route was much the same, though I started down the West Ridge in order to descend the next subsidiary ridge to the south, immediately west of the ridge I had ascended. This proved a somewhat better route and the descent went quickly. I was back at the bike just after 8a and back to the van less than 15min later. 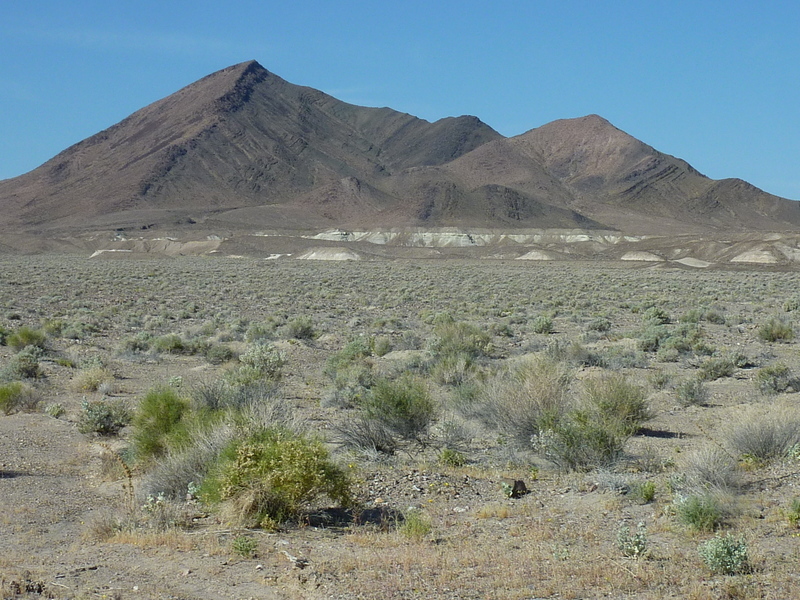 This minor summit is found at the north end of the Sperry Hills, just west of the town of Tecopa. Zdon describes a 2.5-3mi route to Tecopa across McLain Park from the west starting at SR178. I noticed as I was driving to the start of this intended route that the paved road to Tecopa gets within about 1.8mi from the summit on the NE side. It would be unusual for a guidebook to suggest a longer route so I thought maybe I missed something. I ended up driving all the way around to the west side to verify the extra distance with the GPS, then drove back to the NE side to climb it from there. Besides being shorter, the prominent NE Ridge seemed a more interesting climb than a random climb up from the west. The area just off the road from where I parked features a small section of badlands that might prove time-consuming. I noticed a road leading off from the parking area and decided to use the bike to follow this as close to the mountain as possible. I didn't get very, only about half a mile, and most of that was not in the direction of the summit. But it did take me south to the edge of a broad wash leading up towards the summit with the badlands just to the north. I left the bike here and started up the wash system. I followed in the sandy stream channels for about 2/3mi before climbing to higher ground and onto the NE Ridge of Tecopa. The ridge was rocky as expected but nothing special, devoid of the interesting scrambling I was hoping for. I reached the summit not long after 10a, having taken almost exactly an hour. I found nice views, a benchmark, the remains of an old survey tower and a register left by the humorously named OPS (Obscure Peak Section), a large group of San Diego folks that included the the trio of Adrian, Carey and Hanna. It wasn't too surprising to find this summit far more popular than the last. Being so closed to Tecopa, the highway and the hotsprings means a lot of folks staring up at the mountain and thinking, "I should climb that." Rather than take photos of so many pages, I simply took a sampling from pages containing names I instantly recognized, including MacLeod/Lilley, Terry Flood, Don Palmer and a few others. I retreated off the East Face, a somewhat faster descent than I could have made back down the NE Ridge. I eventually found my way back to the same wash, returning to the bike around 11a. I managed to get a flat tire on the 4min ride back to the start and spent a good deal more time than that fixing it before heading out. It was starting to get quite warm out and I knew the afternoon hiking would be a lot more tiring. This P1K lies in the southern half of the Resting Springs Range which acts as the western bookend for the Chicago Valley (with the Nopah Range on the east side). SR178 east of Shoshone runs through the northern part of Chicago Valley and provides the shortest access to the summit. I stopped in Shoshone, little more than a gas station, restaurant, market and small indian community, for the largest soda I could purchase (44oz, for the curious), another trick for warding off the midday heat. It was noon when I pulled to the side of the road at my starting point. I spied an old road heading west and thought this might be another good place to use the bike, but it turned out to be more worthless than Tecopa. I managed about 50yds before the road, poorly defined to start with, just disappeared. I left the bike where it ground to a halt in the soft gravel within view of the road, not bothering to take it back to the van and set out on foot. More than half the 3mi distance was taken up in crossing Chicago Valley over the gradually rising desert floor to reach the base of the mountain. I had intended to follow a narrowing wash most of the way up the side of the mountain but found the ridgelines somewhat less brushy and more interesting. There was some class 3 scrambling found near the top, but most of it was easier class 2, steep and loose, but not really difficult. The register here had been left more than 8yrs ago by John Vitz without a single entry until my visit. Now this was an obscure summit. My return was via the same route. There appears to be an interesting ridge hike south along the crest of the ridge to other, lower summits, but it was much too warm and I'd had enough elevation gain for one day. Much as I enjoy the outdoors and wild places, the heat had me dreaming of air conditioning. It was nearly 3p by the time I reached the bike (which as you can see from the photo is not substantially removed from the van). Time to take a shower and crank the AC.